Were you “pulling” for me then? Would you do it again? Many of the blog entries I’ve posted here are intended to share what I’ve learned, to help others when I can. In this post, I’m asking for your help. 20 years ago this July, I was part of something special. At the 1996 Summer Olympics in Atlanta, I was on a rowing team that won 6 Olympic medals; Canada set the rowing world on fire! When my rowing partner, Kathleen Heddle and I won our 3rd gold medal – and a bronze the next day – we set a standard that has yet to be met by any Canadian Summer Olympian. I was so fortunate to be part of such an incredible era in Canadian Rowing and I want to do something to recognize this 20th anniversary: I want to do something that gives back. When the opportunity to ride in the 200km Ride to Conquer Cancer came along I knew that this was my opportunity. Many of my teammates and my family – and yes, my teammates are like family to me – have been affected by cancer. I’ve lost both of my grandmothers – one who inspired me to dream huge dreams and the other that I never had a chance to get to know — to cancer. I’m not going to name them as it is there story to tell, but too many rowers that I know have had to fight –and I’m so fortunate to say – and beat cancer. Cancer doesn’t care about your age or your fitness. My father-in-law has recently beaten his 2nd cancer with the cutting-edge science of stem cell treatment. I want to be part of the team that sees way more victories like his. I would be so grateful if you would help me to recognize the 20th anniversary of something special – by doing something special. It’s ambitious, but so is Olympic gold and conquering cancer; my goal is to raise $20,000. Just as every stroke made a difference, so does every donation. When we got home from the Olympics and traveled from coast to coast to coast, Canadians told us that they had been pulling for us. Was this you? Were you screaming at your TV, dreaming our dreams and willing us to win Olympic Gold. 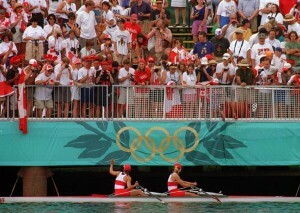 Did our win make you feel proud to be Canadian and inspired to try something that challenges you? I’m hoping that if this group would pull for us then, maybe can “pull” for us now. I’d be honoured if you would. ps – why Team BMO? It’s pretty simple, a friend asked me to join her team and the idea caught my imagination. 200km will be tough for me. These days I spend my time parenting not training. My cardiovascular strength seems okay, but my strength?? ?… I’ve got some work to do in the next month. Over 70 people, and their families helped me to recognize something special and more importantly achieve something special. On July 11th and 12th, Deanah and I rode in the Ride to Conquer Cancer where over $17.3 million was raised for the Princes Margaret Cancer Centre. This is one of the top 5 cancer research centres in the world. As you know, my goal was to raise $20,000 for cancer research; recognizing the 20th anniversary of the success of Canadian rowing at the Atlanta Olympics, particularly the 3rd Olympic Gold Medal that Kathleen Heddle and I won. This disease has effected too many friends/team mates and family members. Through my supporters – I was able to raise $23,475 – I am so grateful. The widespread support I received was remarkable. Together, Deanah and I raised $26,675, we are so thankful. The ride ended up being about 220k. 98 on Saturday and 122 Sunday. The first day – Toronto to Hamilton was an effort!! A huge head wind made it a total grind. Sunday was lovely. Almost all flat and nice roads which lends to chatting and getting to hear peoples stories. That part of the event – hearing peoples stories – was incredible. From the opening ceremony/start we had tears in our eyes. We heard stories of loved ones lost and battles won. There were many cyclists with yellow flags indicating that they are survivors and along the roads there were hundreds of people cheering, some with signs of encouragement and thanks. One sign that sticks in my brain was “thank you for saving my life, Pat”. She was a survivor thanking the riders for raising so much money for PMCC.